What makes RPA Training an IT Buzz which is trending everywhere? Almost all the IT business leaders have opined that applied AI is where the future lies. If a business wants improved business results and reduced wage costs, then automation intelligence is the place where the solution lies. With the reduced scope of manual errors and faster service you can maintain a very beneficial business process workflow. 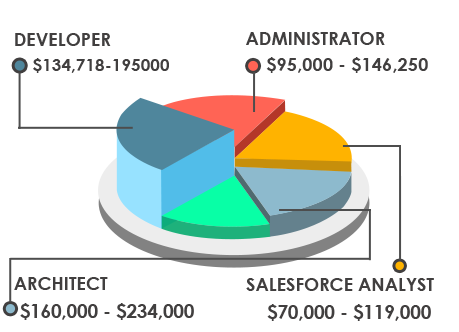 If we talk about the future of CRM systems then Salesforce reigns with excellence and so does the Salesforce developer and administrator certification training courses. The personalized and interactive user-interfaces are the biggest reason why enterprises just love the Salesforce. Various RPA certifications are available for the individuals who want to get recognition in robotics and AI fields. Certifications help you to become the preferred choice of the recruiting managers and help you start your career with your dream roles such as RPA Consultant, Developer, Analyst etc. Your goal is our responsibility! "We can help you secure your future in this digital storm by training you in software robotics, bots creation, and smart machine learning." 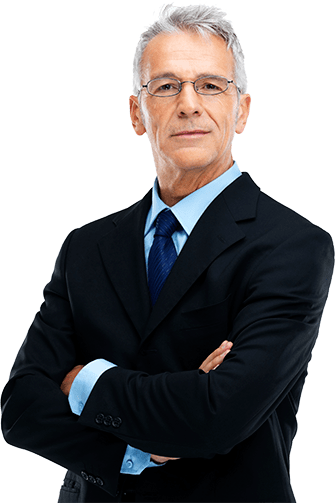 "An experienced professional to guide you all along your learning pathway"
We constantly evaluate our instructors because we want to provide you with the best training that only an expert can give. "An all-time support system to facilitate anytime learning"
We are always there to answer your queries be it 4 am or 4 pm. You have a doubt just leave us a message and we would get back to you. "Be the curator of your own course to learn your way"
You get the liberty to customize your sessions by giving us a feedback. We can arrange everything as per your needs. "Dive into the sea of innovation with a plethora of learning resources"
We understand that books can get boring to read that is why we provide you with podcasts, blogs, live-quizzes etc to enhance your learning experience. 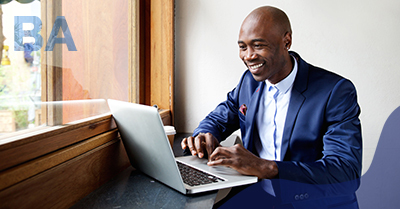 "Get everything that you need at one single platform"
We incorporate the concepts of the most recognized certification courses already in our curriculum. Not only this, you also get pro-tips on certification exams. "You don’t have to match our schedule as we match yours"
Like we said our online RPA training is all about training you in the most comfortable way and that is why we have kept your sessions’ schedule to be very flexible. The aim of the course is to give you a complete RPA training for mastering the concepts of Robotic Process Automation, various tools in RPA, usage of UiPath tool and studio. The main target of this RPA training course is to give you an insight into the upbeat and exciting prospects of Robotic Process Automation. The course aims to provide you the knowledge to will help you deploy RPA principles and tools on your job. You will learn about the practical functioning of the key RPA tools as well as workflows which are used in intelligent automation along with steps for implementing RPA. This training course offers you the hands-on training in Robotic Process Automation along with UiPath to enable you to be a certified RPA professional. You will learn about several industrial applications of RPA, various key guidelines for implementing RPA in your company along with hands-on projects and real-life case studies. ? 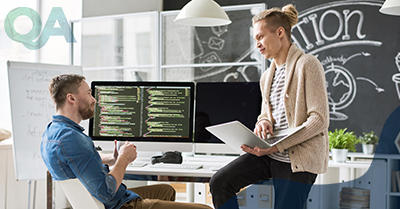 You will learn how to Design considerations for RPA solutions. For the beginners, the course starts with a brief introduction of RPA, AI, and machine learning to deliver you all the necessary skills required to start with this technology. No technical background is needed but you should have to have the willingness to learn something new, trendy and difficulty. The course will teach you about automation and robotics technology from the very scratch so that you can get a broader understanding of the technology. In the advanced stage, we first brush up all the basic concepts you have learned earlier at the beginner's level. This is time to read in detail about RPA tools, knowledge in building workflows by using varied data types. 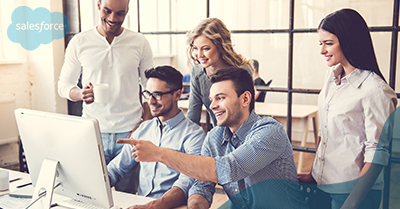 Moving ahead, our instructors will make you adept in concepts and industry best-practices of Desktop, Web, and Citrix Automation. 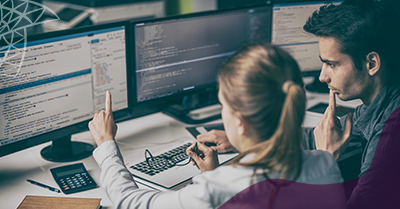 There are no specific prerequisites that you need for the exam or the certification, but having a good hands-on experience on RPA basics or UIPath tools would be an added advantage certainly. Once you have completed your training course and have submitted the final project, it will be reviewed by our panel of experts. You will be given an RPA Certification as per the recommendation of our experts. You will also get special advice on taking the trending certification exams, how to apply for job interviews, what are the most frequently asked questions etc. If you are looking forward to a career in automation intelligence, robotics, and AI then JanBask Training’s RPA Training course is the best as it is very comprehensive and up-to-date. 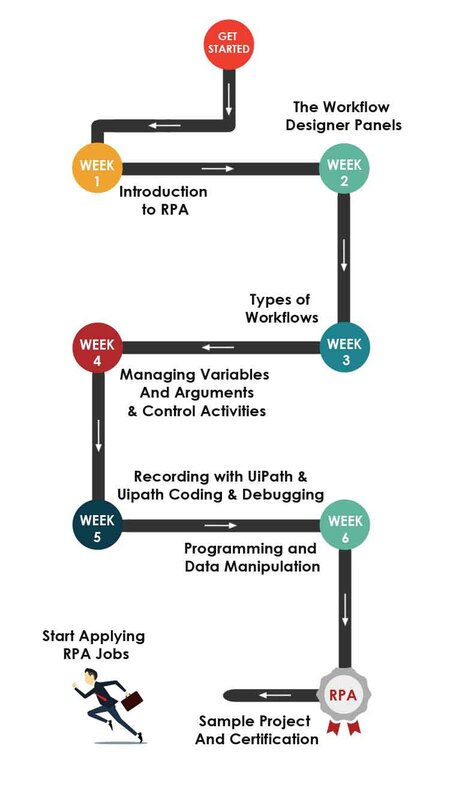 I don’t know where to start praising this amazing online training course on RPA, from, the curriculum, the mentor, the support team, everything is marvelous. Would recommend to all. A very novel training course on RPA that introduces you to the world of robotics, software automation etc in a very easy manner. 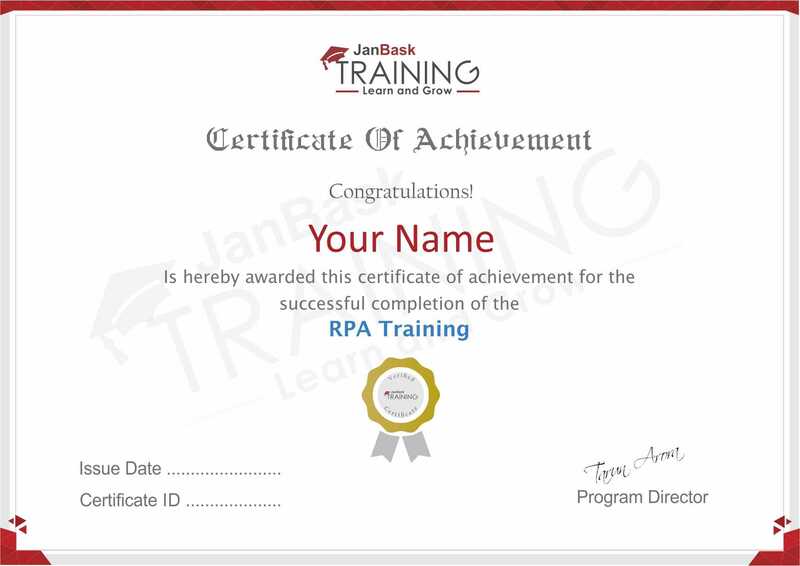 JanBask Training’s course on RPA training is very detailed and comprehensive. It covers a good number of topics in a very short span. Total value for money. For a beginner in robotics, this course gives a good foundation to build upon as it discusses the basic concepts nicely. A very good curriculum that takes care of everything. A good informative training in RPA principles and concepts at JanBask Training. The instructor is very knowledgeable and encourages you to push forward. The online RPA course offered by JanBask Training is quite suitable for beginners, as it is well structured and the concepts are explained clearly and in much detail. If you are looking forward to taking a course on RPA then the one offered by JanBask is the best as they provide hands-on training as well along with the theoretical knowledge. What is a Demo class is it chargeable? At JanBask Training we offer you with a trial session of your RPA training program to assess the quality and kind of our training process. Once you get yourself enroled in a course you can opt for this trial session. It is free of cost and if at all you think are sessions do not match up your anticipation then you can opt out. How will the interactive session for RPA course help me grow? All the sessions that you get with us are in real-time which are delivered by our world-class experts LIVE. This is to provide you with an interactive learning wherein you can ask questions and get your doubts cleared right when the topic is being covered in a class. You get to participate in debates, live-quizzes etc. This makes your learning more fun and interesting. What difficulties are faced by non-IT professionals during RPA Training? Though all our sessions begin from the very basics of any concept yet an individual from a non-IT background may find it a little difficult to cope up. Yet you do not have to worry because your Trainer would start everything from the Scratch. Therefore, you do not face any difficulty as it’s not very necessary to be from an IT background to become a master of a certain technology, all you need is a keenness to learn and guidance from our instructor. Who delivers the sessions for RPA training and certification course online? They also go through our strictly channelled selection criteria before being associated with us. In addition to this, every trainer is then made to pursue a mandatory induction program that helps them to get familiarize with JanBask Training’s learning edge methodologies.